The student literary magazine Poetry and Audience was founded by student Ralph Maud in 1953, and is one of the longest running poetry magazines in the United Kingdom. Despite its humble origins as a cyclostyled, one-penny, student journal produced approximately once a week during term time, it quickly developed an international reputation and has published some of the most distinguished poets of the late twentieth century. 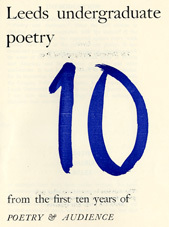 The first issue of Poetry and Audience was published in October 1953, and featured on its first page a poem by the Gregory Fellow in Poetry, John Heath-Stubbs. Heath-Stubbs was also credited as an editorial advisor, establishing the precedent of a close association between the Gregory Fellows and the magazine which would be taken up by most who held the Fellowship after him. The contribution of the Gregory Fellows in Poetry to the magazine, both in terms of submissions of poetry and editorial advice, is evident on surveying the issues produced during the period that the Fellowship operated. They were also, sometimes, influential in attracting submissions from their contemporaries, although this should not detract from the fact that Poetry and Audience attracted attention from contributors from other areas through its own merits as a forward-looking poetry journal. Gregory Fellows in Painting and Sculpture also became connected with the magazine: Hubert Dalwood designed the covers for volume 5, and also presented a relief sculpture intended to be the 'personal property' of the Editor during his/her term of office. Only a few months after the magazine had first been published, it had attracted the attention of poets from outside the University who were beginning to establish their reputations. Poems by Kingsley Amis and Philip Larkin featured in the eighth issue of Poetry and Audience, published in January 1954. This phenomenon was not short-lived: amongst those whose poems have appeared in Poetry and Audience from this time onwards are Philip Hobsbaum, Roy Fisher, George Barker, Seamus Heaney, Norman MacCaig, Peter Porter and Ted Hughes. The importance of Poetry and Audience to aspiring student poets, and the opportunity it gave them to publish their work (particularly when it might appear alongside that of poets such as Hill, Larkin and Hughes) should not be overlooked. Writing in the Foreword to the first Poetry and Audience anthology, published in 1960, Bonamy Dobrée echoed lines from Herbert Read's Introduction to Leeds University Verse 1924-1948, stating: "For young people to see their work in print ... in the company of the poems of others, provides a standard of comparison and acts as an incentive." (4) He also noted his tremendous pleasure in first seeing the journal, and the "exciting" and "stimulating" work undertaken by both contributors and editors. Poetry and Audience certainly appears to have been an important publication for many students, both writers and readers. Tony Harrison remembers that the magazine's frequency and immediacy meant that there was quite a "buzz" when new issues came out. (5) At times when contributions were low, the editorial board sometimes found themselves under pressure to write poems in order to fill the next week's issue; Harrison saw this pressure on creativity as a positive thing for a young poet. Anthony Mortimer also remembers the importance of Poetry and Audience for student readers and writers, commenting: "The magazine really did live up to its name in that we really did have an audience. People would come up to you in the bar or the coffee room and say what they liked or didn't like about what you'd written." (6) This, combined with the regular opportunity to meet and discuss poetry, literature and the theatre with contemporaries who shared similar aims and interests, was both important and fulfilling in terms of the development of young creative artists at Leeds. 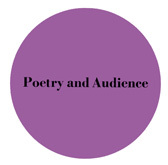 Poetry and Audience 1953-60 was the first of several anthologies compiled from contributions to the magazine. When the idea of producing it was first mooted, the editor Anthony Mortimer wrote to Eric Gregory seeking a donation towards its production. Gregory was only too keen to oblige, stating: "I should be glad to encourage in any way I can the cause of poetry in your university." (7) He contributed £10 and indicated that he would be willing to help further as the anthology progressed; he sadly died shortly after this. On publication, the anthology was dedicated to his memory. 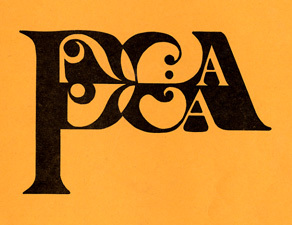 During the 1960s, the publication of short anthologies of the best poems from Poetry and Audience from the previous academic year became common practice. 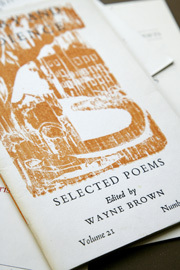 Amongst the other anthologies issued were a volume made up entirely of undergraduate verse from the magazine's first ten years; and 21 Years of Poetry and Audience (1976). The latte was instigated and co-edited by Gregory Fellow Wayne Brown. 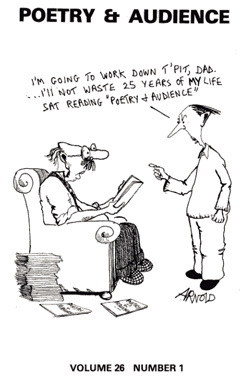 The publication of Poetry and Audience has continued throughout the 1980s and 1990s, and into the twenty-first century. It is still produced from the School of English, although it now appears bi-annually. (1). Conversation with Tony Harrison, 11 October 2007. Kathryn Jenner/Leeds Poetry Project. (2). Anthony Mortimer, Email interview, December 2007. Kathryn Jenner/Leeds Poetry Project. (3). Tom Wharton and Wayne Brown, 'Introduction,' 21 Years of Poetry and Audience, ed. Tom Wharton and Wayne Brown (Breakish, Isle of Skye: Aquila, 1976). (4). Bonamy Dobrée, 'Foreword,' Poetry and Audience 1953-60: An Anthology, selected by A.R. Mortimer et al. [Leeds: Poetry and Audience, 1961]. Dobrée himself contributed a number of poems to Poetry and Audience, which were published under the pseudonym "Hominy Mowbray." (5). Conversation with Tony Harrison, October 2007. (6). Anthony Mortimer, Email interview, December 2007. (7). Letter from E.C. Gregory to Anthony Mortimer (2 February 1959). Leeds University Archive, U: Scholarships and Awards, Box 5.